Your child with ADHD (Attention Deficit Hyperactivity Disorder) is more than just a wiggle worm. When you engage him in conversation he may literally run circles around you. Sitting still at the dinner table? Forget about it. You wonder sometimes if you’ll ever eat at a family restaurant again. “Sit still, please.” Sure, you say these words, repeatedly, yet you know that within a matter of seconds his body will revolt against this ever elusive stillness you dream of. Feeling like the bad parent whose child refuses to listen, the mommy guilt creeps in. Again. And again. What should you do? Medicate? Cognitive Behavioral Therapy (CBT)? Send him away to a special school to learn to control this constant motion? Naturally we want the behavior to stop, don’t we? Ah, but hold on a minute, folks. Maybe that’s not what we want after all. 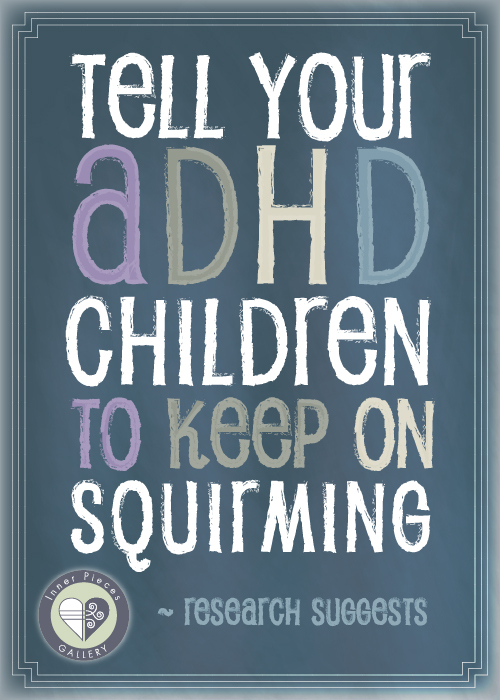 The Journal of Abnormal Child Psychology (2015) recently published a study suggesting that if we insist that our ADHD kids keep still, we may be inhibiting their ability to learn! The excessive movement that so often frustrates parents, teachers and students alike actually helps a majority of ADHD students learn. It keeps them alert, helps them remember, and plays an important role when working out complex cognitive tasks. The study was small, yet it has important implications for how we address ADHD in the future. According to the research, students may perform better in class and at home if they are allowed to move while completing class assignments, homework, and tests. Can you imagine a classroom full of students completing deskwork while sitting on activity balls or stationary bikes? An interesting idea, yet one that wouldn’t work for every child in the classroom. The study also found that students without ADHD who moved more actually performed worse on cognitive tests, not better. Stay tuned! More fun facts about learning to come.